Hi everyone! It's Day 6 of MFT Teaser Time, and that means it's time for Pure Innocence. Of course there are plenty of cuties to be had this month. 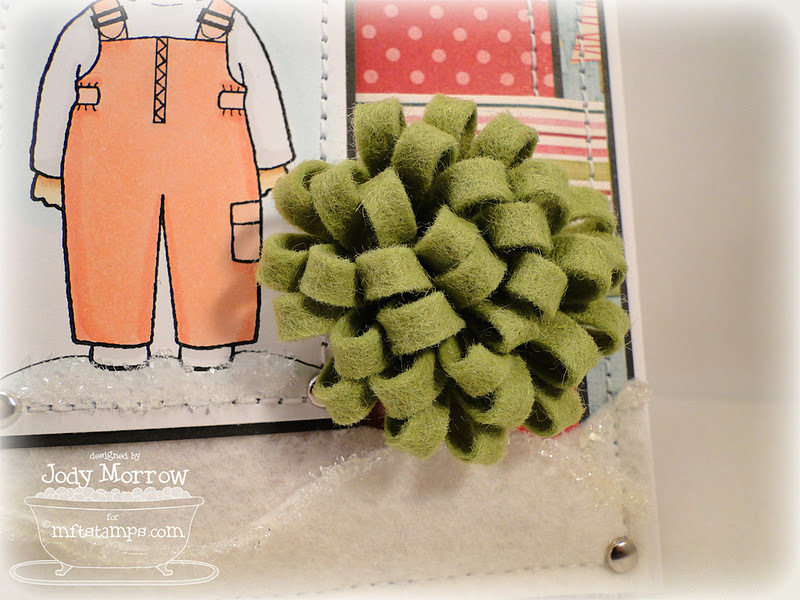 My card uses the Pure Innocence Ski Girl and Loopy Bloom Die-namics. Here is my Loopy Bloom made with green My Favorite Felt. In case you missed it earlier in the week, HERE is my video showing how to assemble the Loopy Bloom Die-namics die. 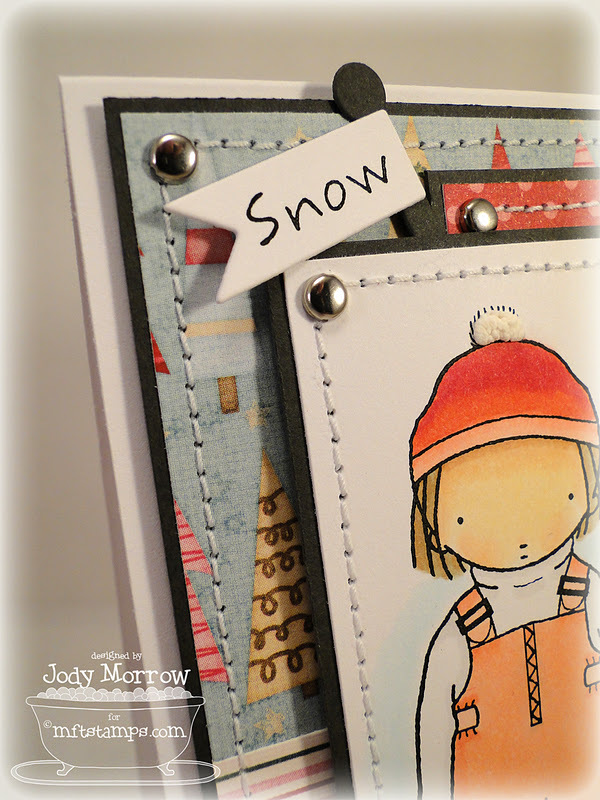 I added the word "snow" to the Mini Pennants Die-namics. I add Liquid Applique to her beanie "fluff". The patterned paper is a limited edition MME from Scrap Ace is no longer available, sorry. Love all the PI releases!!. Your card is very cute!! she's adorable, but didn't know that?! you know i LOVE MY PI's!!! cool dp! This is SUPER cute Jody, I love the rainbow look of her lil beanie!!!! These PI's are SO cute, and we are ONE month away from my Birthday PI Flower girl!!!! EEEEK!!!! You did a PHENOMENAL job designing the die for that cute loopy flower!!! :) I love it! Thank you so much for taking the time to make your great video, too-so helpful! LOVE the felt for the snow Jody!! SOOOOO snuggly!! Love the Fluff on the pom pom on the beanie!! Oh I love that you left the skis off. Could use that for several of our winter activities here in Calgary. Skiing, snowboarding, snow shoeing, cross country skiing, skating outdoors, sledding.....oh my word....I NEED this stamp too! Your card is super super cute! GREAT colours and that loopy bloom is fabulous! OMG girlfriend, she is too cute! The look on her face reminds me of Joely when I use to make her wear her snow pants....LOL!!! She is too cool for that now. I didn't ger her in my stach but I will definitely be adding her in my cart! Loving those peachy tones on your card...perfect with the paper. Great video too! its so ADORABLE...u r so talented..
Jody, your details are always so perfect! Your sewing is straight, your layers are perfect, your brads are just right! i love all the new dies and stamps. your card is gorgeous, your coloring is wonderful, jsut love all that stitiching and the details. Love that fluff. Your shading is great. Her little snow suit looks all puffy, like it should. sooo loving your card, anything with those PI's, everytime I see one I fall in love. Great job! This is so adorable Jody! Beautiful coloring on that snow suit - so pretty and soft. I am loving all the cuteness going on here!!!!! TFS!!!! I am loving all this cuteness going on here!!!!!! TFS!!!!!! So cute Jody. I always love your cards. Your card is just adorable!! This is darling! I love the colors that you have chosen. Thanks so much for the tutorial. Great job! This is so fabulous Jody!! Too sweet! So adorable, love the glittery felt snow! Fabulous video and I love the colour you chose for her ski outfit!! I want one like that!!! Love your little snow chick. Your coloring is great and so is your loopy flower. Such a sweet card! Love that loopy blooms die! 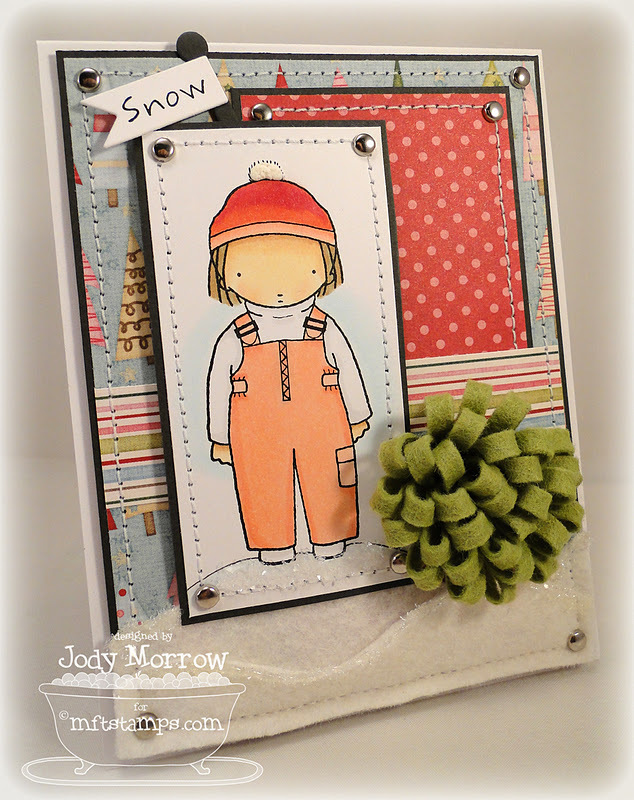 Love the colors you used on the snow girl! Can't wait to use the loopy bloom, too... thanks for sharing such a cute card! Adorable card!! Love the colors you chose for the PI - so sweet! And the loopy bloom is the perfect touch.